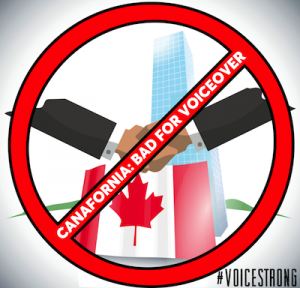 As a voiceover talent, you are no doubt aware of the discussion regarding the disreputable Canadian pay to play company based in the province of Ontario that bought a major California based voiceover lead generation service in August 2017. The voiceover lead generation service has since taken the name of the disreputable Canadian pay to play company. I’ve dubbed it CANAFORNIA. For reasons that I can comprehend but (to me) fail the business logic sniff test, there are voice talents who understand the disreputable Canadian pay to play company is skimming money (keeping it for itself) that producers had dedicated to pay male and female voice talents. These talents also understand that in some other cases, the disreputable Canadian pay to play company is taking the voice talent’s quote and adding a substantial fee (sometimes 3 to 4 times the talent’s asking price). Talents would NOT know this because the disreputable Canadian pay to play company does not allow ANY communication between talent and client. That’s how the disreputable Canadian pay to play company takes extra money without the talent knowing it. Yet knowing all these truths, these same voice over talents continue to pay an annual fee to the disreputable Canadian pay to play company and audition (maybe occasionally book) jobs at a lesser fee. It appears to me these talents (some of whom are my friends and are talented, smart people) are shooting themselves in the foot to pay for a service that might book them a voice job at what promises to be a rate less than what their client thinks they are paying them. In short, the voice actors working with the disreputable Canadian pay to play company are making less money than they should be. 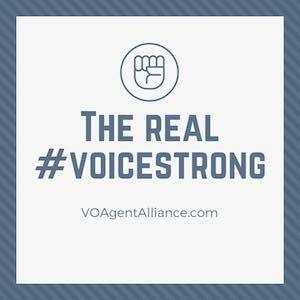 Just a quick note, a great way to avoid working with voiceover P2P companies that will scam you is to work with agents in the VO Agent Alliance. That’s my opinion and I get nothing for it. Are all these discussions just rumors and innuendos against the disreputable Canadian pay to play company by disgruntled voice talents? The reason so many voice talents and voice agencies will NOT work with the disreputable Canadian pay to play company is because the company’s unethical behavior has been well documented. But this week, voice talent Rick Riley shared his story about the disreputable Canadian pay to play company on social media. Facts are facts and the facts indict the disreputable Canadian pay to play company directly. What follows is Rick’s September 2016 account of what happened. Since that time he notes he has not done any business with “the disreputable Canadian pay to play company”. Rather feature the company name or initials as Rick did in post, I share replace it with “the disreputable Canadian .pay to play company”. Right now, “the disreputable Canadian pay to play company” is an extremely heated subject, and rightfully so. I recently replied to Bob Bergen’s post regarding “the disreputable Canadian pay to play company”. With that, I feel I should reveal my involvement with “the disreputable Canadian pay to play company” and their practices. I contacted someone in the industry who was compiling a case against “the disreputable Canadian pay to play company”. She asked me to relate my experiences. This is the email I wrote to her with names redacted by (_______) lines. The first case was in regards to an IVR session I was asked to do. As a rule, that’s not what I do, but I have done a lot of commercial work for this company and they wanted me to be on their phone when people called. “The disreputable Canadian pay to play company” contacted me and asked if I would do the job. I quoted and “the disreputable Canadian pay to play company” came back a couple days later saying that my rate was too high, and they would look someplace else. When you read the emails below, you will see that “the disreputable Canadian pay to play company” was willing to ace me out of a job if they couldn’t have their exorbitant commission. Below is the email I provided the person doing the research. A “disreputable Canadian pay to play company” managed project in which the client wanted me but didn’t have the budget so they contacted me directly. The following is an email exchange with a client who happened to have my contact information. I just wanted to reach out to apologize of the back and forth on this latest ____ phone tree job, my client(the agency) is not making any progress with their client on the budget and at the current rate i will not be making any money on this job. We talked last time about going to you directly and i mentioned that i felt it was only fair that i stay loyal to “the disreputable Canadian pay to play company”, but now i may back track on this if the price changes so that i can make some money. What would be the cost of this project if i dont go through “the disreputable Canadian pay to play company”? Just out of curiosity, what is “the disreputable Canadian pay to play company” charging you? You see, that is a bunch of crap. I told them $250, which is my session minimum. I had a feeling they were charging way beyond what an agent would charge. THIS is why they are getting a bad rap and why they won’t allow communication between the client and the talent. “A different pay to play company” charges a subscription fee just like “the disreputable Canadian pay to play company”, however “a different pay to play company”, once the client and the talent make a connection, steps out of the equation. Well that settles it then. I will reach out to you directly from now on. When are you available between today and monday? ____ at “the disreputable Canadian pay to play company” mentioned tomorrow, is that still the case? And how would you like to set up payment? A 70% commission and “the disreputable Canadian pay to play company” was willing to let the client go and ace me out of a job because they couldn’t get it! A job booked through “the disreputable Canadian pay to play company” that kept getting revisions. I did the second minor revision at a low rate for goodwill towards the client. The latest revision, before I quoted for it, had me calling the client because I wanted to make sure they were getting the benefit of my goodwill. Turns out “the disreputable Canadian pay to play company’” greed did not let me down. For the original 30 sec spots for a Canadian company I quoted $1,000. First round of revisions I quoted $500. Second round of revisions I quoted $100 as a goodwill effort. When “the disreputable Canadian pay to play company” contacted me for a quote on this latest minor revision, before I gave it to them I decided to call the company and find out what they were paying “the disreputable Canadian pay to play company” on what I had quoted them. When I quoted $1,000 for the original spots, “the disreputable Canadian pay to play company” charged $1800. When I quoted $500 for the revisions, “the disreputable Canadian pay to play company” charge $795. When I quoted $100, “the disreputable Canadian pay to play company” charged $155. 80% commission, 60% commission and 55% commission respectively to “the disreputable Canadian pay to play company”. THAT is “the disreputable Canadian pay to play company” in a nutshell! Now THIS company will be working with me directly as well. That’s my exchange with the person doing research. Knowledge is key in all aspects of life. Hopefully this knowledge about one person’s experience with “the disreputable Canadian pay to play company” will help you make decisions in your own personal endeavors.